I’m pleased with how it looks…but I may get a few more flowers and carry them further around the face. I really like the poofs around the side of the hat! 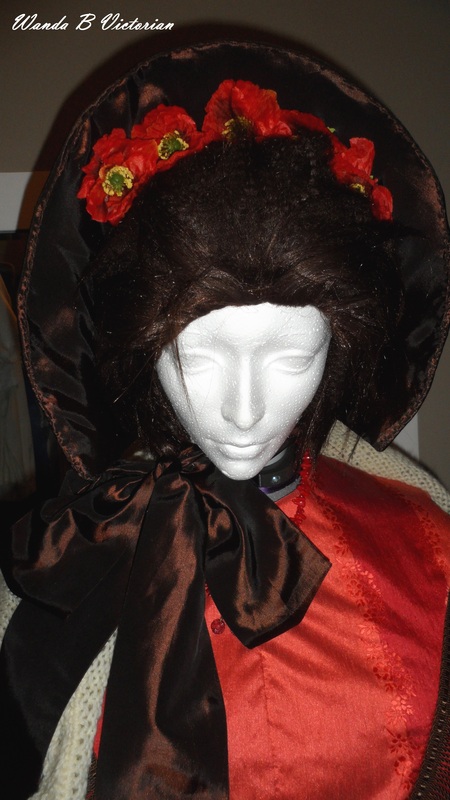 The ruffle in the back was the only fiddly thing in making this hat. I really like this pattern! How historically accurate is it? About 80%. The fabric is iffy (I have no idea what was in the flannel) and I’m sure they didn’t use hot glue. One of the birds at work is ill and needs antibiotics twice a day. The process involves throwing a face cloth over her, picking her up, flipping her on her back and injecting the medicine in her mouth. For a sick girl, she is very good at letting me know she is not amused. It is an ordeal for both of us. And there are not many co-workers willing/able to do this. To avoid having to go into work on my days off, I have brought them home with me. I don’t think I will be getting pet birds any time soon. The noise is driving me crazy…whine, whine, whine. 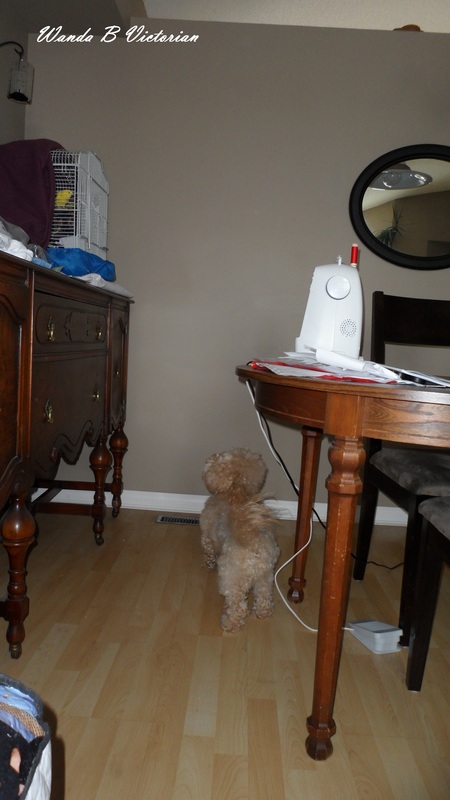 Obviously, the whining is coming from my dog. Today is the day that the Dreamstress has set for completion of her 6th Challenge “Stripes”. 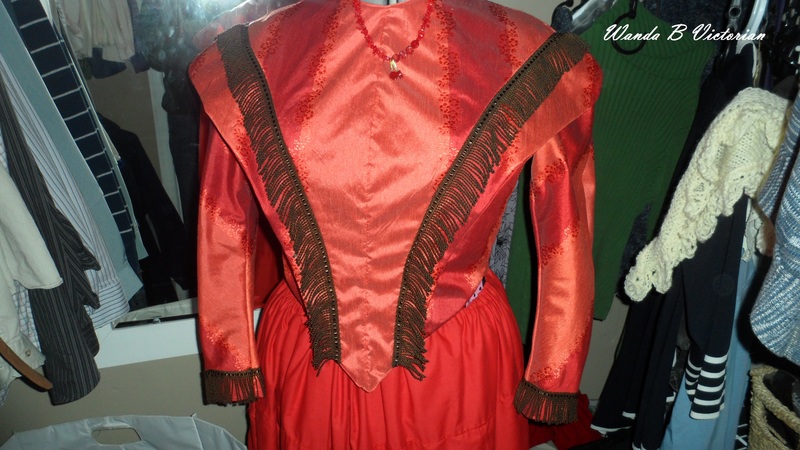 I had hoped to have my whole 1840s copper penny dress done but alas, I only managed to finish the bodice part. 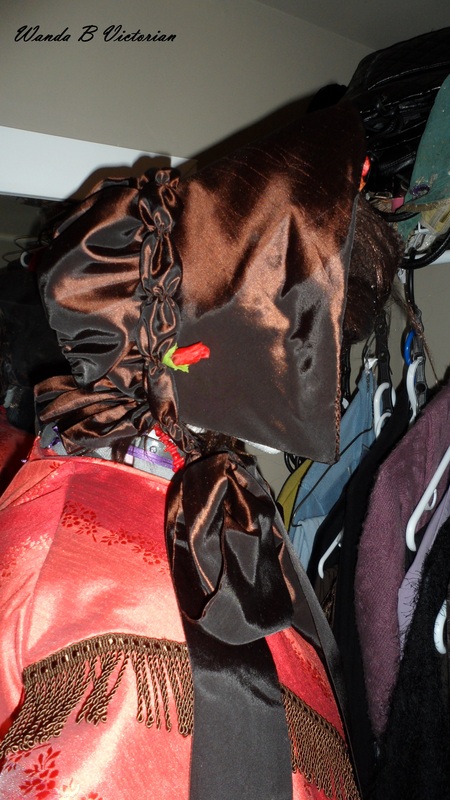 (Except for the hooks in the back that can only be added once the skirt has been added on.) I’m pretty pleased how it looks on Trudy. I have yet to try it on. I’ll have to wait until I can find someone who can pin the back shut for me. 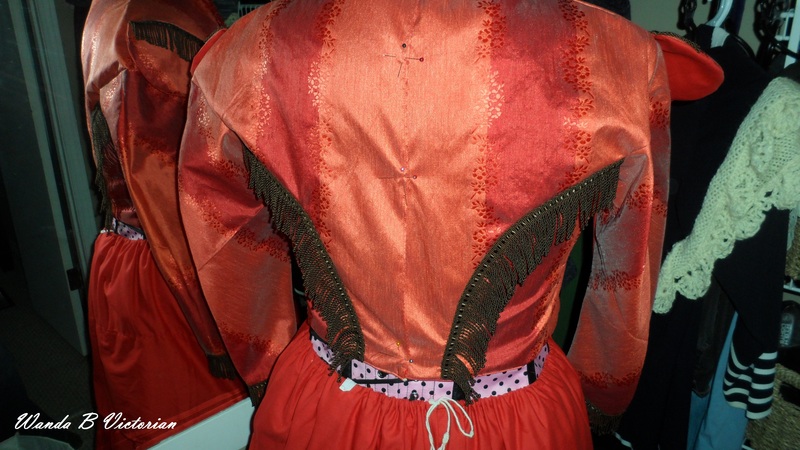 I’m not sure I’m loving the fringe on the back…it reminds me to much of a country and western shirt. I hope to get the skirt done in the next week. This means I can submit it for the Squares, Rectangles and Triangles challenge in June. I have a tintype to show you today. Tintypes were a type of photograph that were around prior to the paper format of cabinet cards and carte de visites. They did keep making them after cabinet cards and carte de visites came into vogue in the 1860s, but they existed as carnival activities. For a brief description of a tin type go here. Basically, the photograph is on a thin sheet of tin. Sometimes you can find them in the original paper sleeves, but being paper, they didn’t always survive. I am fortunate enough to have one of a lovely young girl and it is still in its sleeve. When you zoom in on the photo you can see that she has some seriously big earrings and a big pin or pendant on her neck ribbon. She has great hair too. 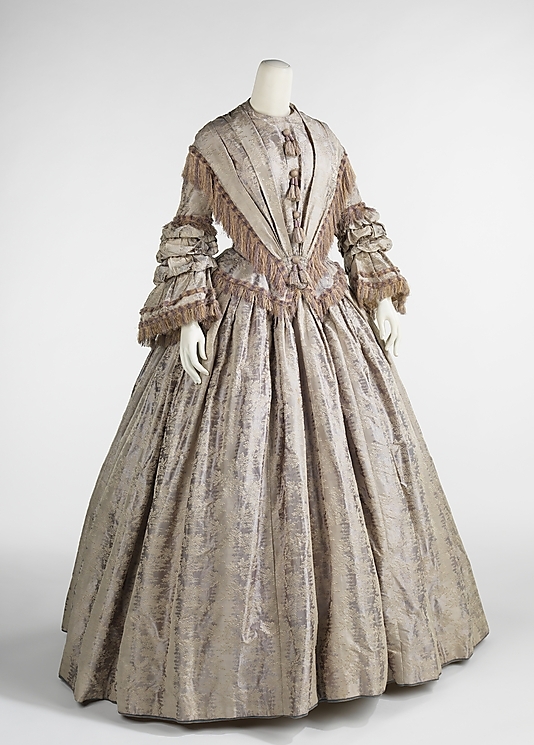 I can’t imagine she wore that for day time wear but may be she did. If she were young enough and rich enough to not worry about getting in her way while she worked. I wish I had a bit more information on hair styles. 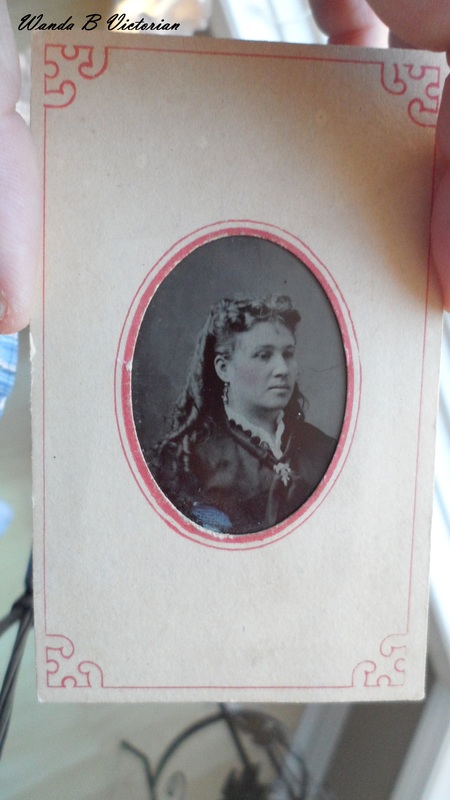 I estimate this to be an 1870s tintype (past the era of greatest popularity) because I have found another tin type with the same paper design for photos that have been estimated at early 1870s. Go here and scroll down to 1870 where there is a tintype of a young child standing. Also, scroll down to 1871 to a photo of an older man. These papers are exactly the same but the paper on mine is in much better shape. There is only slight damage on the tintype itself which is nice. They scratch easily. Obviously, this has been kept in a safe place most of its life. I could learn to like regency…. 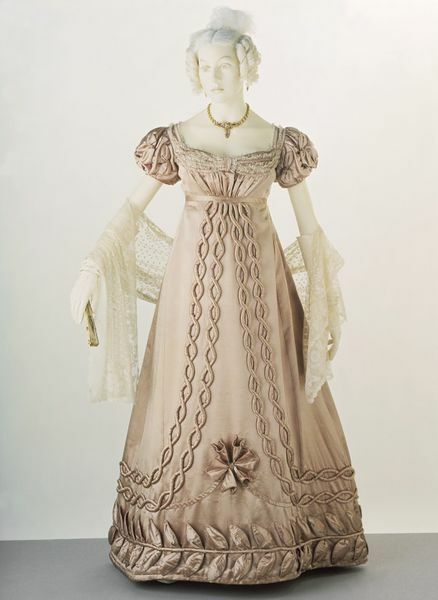 I could learn to like regency if the dresses all looked like this… What a lot of work! 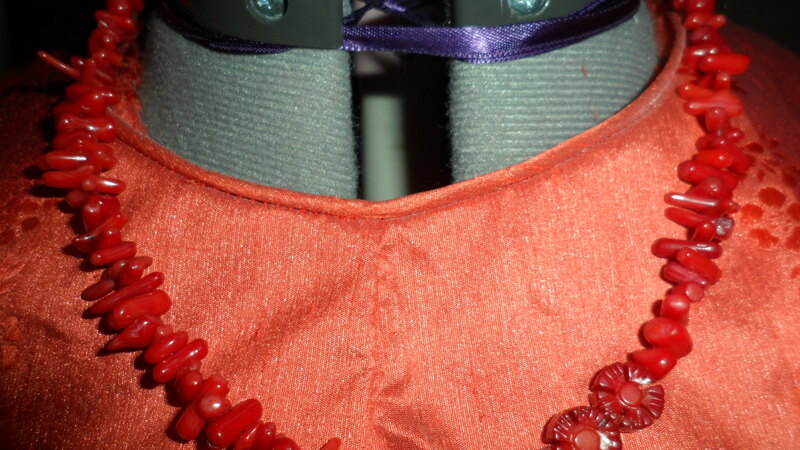 As far as the sewing goes, it is hard to see that I made any progress at all. But, I have made some. I add the revers (the lapel like things) as I decided they make the lines look like a better match and because it looks more like the dresses I’ve been looking at from the Met. See…. I’m going to add my fringe like this dress has. Yesterday, I got some of the piping done. Gosh, I hate piping. What a tedious amount of prep work to be done. 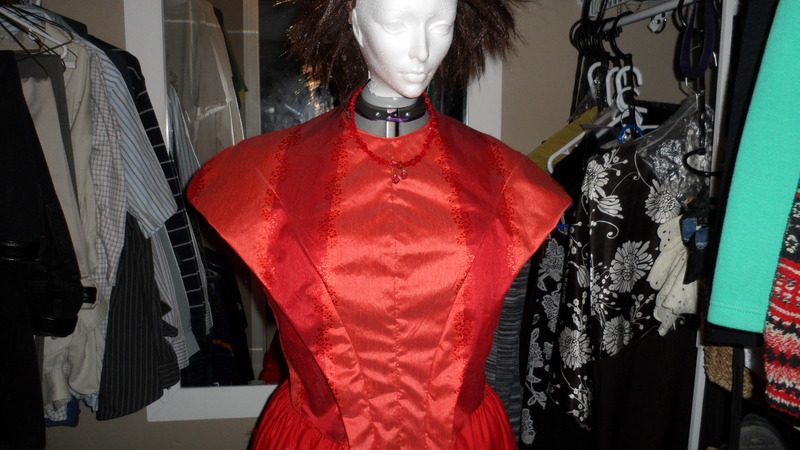 I still have to do the bottom edge of the bodice. I still have to iron that neck piping down and I think I will have to tack it down in a few places because the raw edge insists on rolling out of the neck. The annoying thing is, I’m probably going to be covering that with a crocheted collar. And now that I’m looking at this blown up photo…I think I have to figure out how to adjust the tension on my new machine.